I am so excited for this week's LOTM: Mountain Haven, because I have just the place. Growing up in Arizona I was lucky enough to be surround by mountains. Phoenix is in a valley, which meant it was only a 10 minute drive to my favorite hiking spot: Piestewa Peak (formally Sqauw Peak) one of the mountain preserves surrounding Phoenix. In fact, Will and I will be hiking it again next week once we get into town! I think one of my favorite parts of Piestewa Peak is that once you get on top you get an amazing birds eye view of the busy city of Phoenix. When I was younger we would hike up the mountain early in the morning and eat breakfast on top, which I always enjoyed. Even back then, though, the hike was pretty darn popular, so you have to time your hikes just right in order to avoid having tons of people hiking with you. When you do unwittingly end up with a lot of other hikers you will often see mountain joggers who are actually running up to the top (they have far better knees than I do). There's also those people just walking up the mountain talking loud enough so everyone can hear about how they ran up the mountain in only *insert time* the previous time, but this time they "just want to enjoy it", hehe. 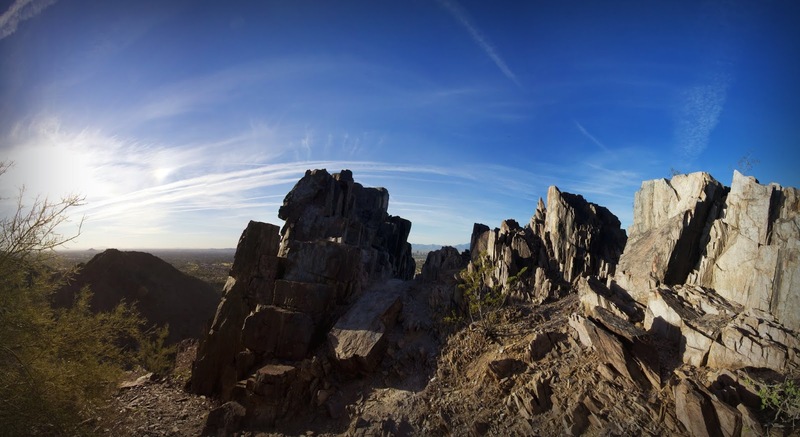 One of the coolest things about our last trip to Piestewa Peak was that we took our Nishika "3D" camera with us and got some really fun pictures! I think we are going to have to bust out this camera again on our big tour around the country! I want to thank all of the amazing LOTM ladies for having me as a guest poster this month, I had a blast! I cannot wait to see all the other guest posters who will be joining them in the coming months! Thanks again ladies! Now go check out their mountain havens! beautiful view! have a lovely thanksgiving! What beautiful photos! The sky is just gorgeous. I just love the mountains. There is nothing more beautiful. I hope your trip is going well!! This is such a great post and makes me want to go to Arizona so badly! Ahh what beautiful scenery! And those 3D pics are SO COOL lol Really enjoyed this post!! These pictures are amazing. I miss the mountains! wow! The 3D camera is amazing! !